Records mention a network of messengers during the 10th century and early letters were carried in the form of a roll, with a wax or a lead seal. Early seals have been dated from 1079 and the earliest surviving cover was sent in 1391 from La Tana (now Azov) to Venice. By the 16th century, 1,600 postal locations were established, the 1634 treaty with Poland established a route to Warsaw and reforms under Peter the Great improved the postal system. In 1716, the first postal office opened in Moscow and St.Petersburg. The earliest Russian postmark is dated from July 1765 and is a single line reading ‘ST.PETERSBOVRG’. Postal stationery appeared in 1845 and their use was expanded from December 1848. As some European countries adopted the British ‘Black Penny’ postal system, the Russian authorities considered it in September 1856. The first stamps went for sale on 10 December 1857 but were validated for use on 1 January 1856. The 10-kopeck stamp was imperforate and depicted the ‘coat of arms’ in brown and blue. The paper used was watermarked with the numeral but later printings used regular wove paper (1858). While the local postage rate of 5 kopecks was introduced in 1863, the following year saw the emergence of 1, 3 and 5 kopeck values for simplifying international mail rates. In 1874, Russia became one of the original 22 countries forming the General Postal Union (later, Universal Postal Union). The coat of arms design was changed in 1875 for the 2k and 8k values, and for the 1879’s 7k value. The December 1883 issue featured an updated design with the lower values being printed in a single colour, supplemented with new values of 14k, 35k and 70 kopecks. 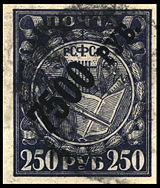 In January 1884, the larger stamps of 3 ½ and 7 ruble were introduced. The designs changed again in 1889 (thunderbolts across the posthorns under the eagle). The first Russian semi-postal stamps were issued at the end of 1904 and were oversold by 3 kopecks for supporting the orphans of casualties in the Russo-Japanese War. In 1909, a new series came out with mixed designs, some new, and printed on non-watermarked wove paper. Russia's first series of commemorative stamps appeared on 2 January 1913 for marking the 300th anniversary of the Romanov dynasty. The series comprised of 17 stamps featuring portraits of the Tsars and pictorial views of the Kremlin, the Winter Palace and the Romanov Castle. By 1915, the effects of World War I on the country were obvious and the Government disintegrated. Stamps were printed on cardboard and used as paper money. During the Russian Revolution, the postal services were disrupted; so much so that a number of factions and breakaway republics issued their own postage with propaganda themes. A few genuine uses have been recorded. In 1917, the Provisional Government reprinted the old Tsarist designs but sold them imperforate. 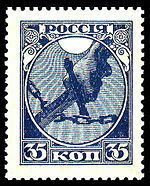 The first stamps of the Russian Soviet Federal Socialist Republic (RSFSR) appeared in 1918 with the design of a ‘sword cutting a chain’. In 1921, another series of postage stamps appeared with values from 1 to 1,000 rubles. But their release occured after the effect of the inflation to the economy. This forced their revaluation in 1922 with surcharges up to 100,000 rubles. The currency reform of 1922 (10,000-to-1 rate) allowed Tsarist stamps to be surcharged with a five-pinted star containing a ‘hammer and sickle’. Also, stamps with portraits of a worker, peasant and soldier came out throughout the 1920s with some variations to these designs.